Nairn Rowing Club constructed its first skiff, the Dulsie, last autumn and has now secured a £1,000 grant to purchase much-needed life-jackets, flares, radios and anchors. Club trustee Bob Ferenth said: “It took a real community effort to launch the Dulsie and we are grateful to everyone who helped us in our mission to get on the water in Nairn. A Bags of Help grant from the Forres’ Nairn Road Tesco superstore funded the purchase of the safety equipment needed for its launch. Nairn Coastal Rowing Club is one of thousands of organisations across Scotland to have received funding through the scheme. Tony McElroy, head of communications for Tesco in Scotland, said: “Bags of Help has been making waves across Scottish communities since it launched in 2015. Tesco works in partnership with charity Groundwork and greenspace scotland to deliver its Bags of Help funding scheme, which awards grants to a variety of local projects across the country, with recipients voted for by customers in store. 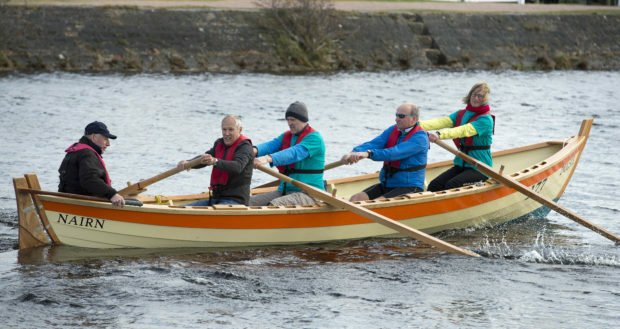 Nairn Coastal Rowing Club membership is open to people of all abilities and was established in 2017 as interest in the sport of coastal rowing across the north grows. Their first skiff, Dulsie, was launched in September last year after completion of the seven-month project. The club merged with Ardersier Boat Club in November 2018. The club said: “Our vision is to bring people together for fun, fitness and socialising with other coastal communities, offering enjoyable and safe coastal rowing experience.